FRANKLIN, IN – A fundraising organization that has raised nearly $250,000 for dozens of Johnson County nonprofits will concentrate on a community-wide run event this next year. Pay It Forward Johnson County will discontinue its fall golf outing for 2017. Instead, organizers will devote their time on their spring 2018 Rock the Block Run community celebration. “Both events require a significant number of volunteers, sponsors, participants and donations. We had to decide which could raise the most money for our local causes,” said Erin Smith, Co-Chair of Pay It Forward Johnson County. Since 2011, Pay It Forward Johnson County partnered with The Legends Golf Club in Franklin for a premier golf outing held annually in September. That event raised more than $195,000 for local charities that provide education, emergency programs, basic human services and healthcare. Pay It Forward Johnson County added the Rock the Block Run event in 2016. 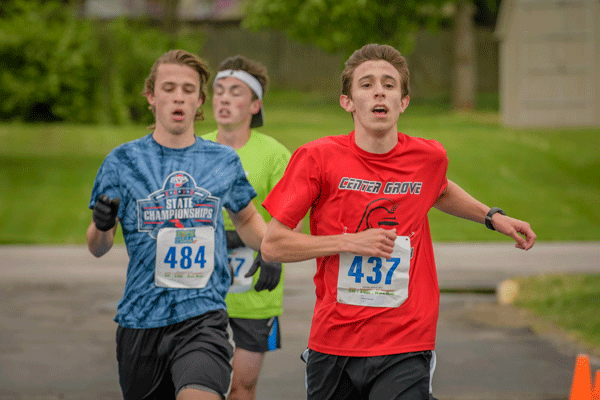 The community run celebration utilizes the Center Grove High School campus, and includes a professionally timed/measured 10K run, a family-friendly 5K run/walk, and a “Main Street” experience including music entertainment, interactive vendor booths and food. “Since we are 100 percent volunteer driven, we have only a limited amount of resources. Right now, Rock the Block Run has the greatest potential for growth,” Smith said. Charities received more than $25,000 at the 2017 Rock the Block Run. More than 1,500 runners and walkers participated. The next event is scheduled for April 21, 2018. Smith said organizers are very grateful to Ted Bishop and Ashely Davidson at The Legends, and their family and staff for the generosity and support with the golf outings the past six years. “We cannot thank Ted enough. He and The Legends staff gave up a lot to host our event,” Smith said. Registration for the 2018 Rock the Block Run participants and recipients will begin in January.